Station 5, located near the intersection of Highway 763 and Highway 63, is centrally located in Boone County, Missouri. The current station, built in the early 1980’s, was relocated from the area now known as the Boone County Fairgrounds (formerly known as the Cottonwoods Airport) following the second Bond Issue that the Boone County Fire District asked voters to approve since it was formed in the 1960’s. Tom Putnam (Captain) has been with the Boone County Fire District since 1989 and a lifelong resident of Boone County. When Tom joined this organization, he was one of the many residents that lived at Station 5 as a station resident. Since then, Tom has been promoted through the ranks at Station 5 where he currently has been serving as Captain of Station 5 since 2007. Kent Brockman (Lieutenant) has been with the Boone County Fire District since 1990 and a lifelong resident of Boone County. Following Kent’s acceptance into the organization, he was also a resident at Station 5 for many years alongside his longtime friend, Tom Putnam. In 2009, Kent was promoted to Lieutenant at Station 5. Adam Burks (Lieutenant) has been with the Boone County Fire District since 2002 and a lifelong resident of Boone County. When Adam first was accepted into the Boone County Fire District, he was assigned to Station 4, which is located in Harrisburg. Shortly after graduating from the academy Adam decided to become a station resident at Station 1 (Lake of the Woods). After a few years of service as a station resident, Adam moved into the Station 5 area where he served as a firefighter until being promoted to Lieutenant in 2011. Clint Walker (Lieutenant) has been with the Boone County Fire District since 2006. Clint moved into Boone County in 2002 from Paris, Missouri and while living in Paris Clint served as a member of the Paris Rural Fire Department. In late 2004 Clint moved into the Station 5 run box and across the street from Adam Burks. After the two got acquainted, Clint applied for the Fire District and was assigned to Station 5. In 2009 Clint was promoted to Station Lieutenant. Justin Putnam (Lieutenant) is the son of Captain Tom Putnam. Justin began his fire service career with the Boone County Fire District in 2009. Since Justin has been with the Fire District, he has been a resident at Station 5. Justin’s dedication and love for the fire service lead to his promotion to Station Lieutenant in 2014. Station 5 is one of the busiest fire stations within the Boone County Fire District. On average, this station will respond to over 100 calls of service each month (that’s almost 3 calls a day!). 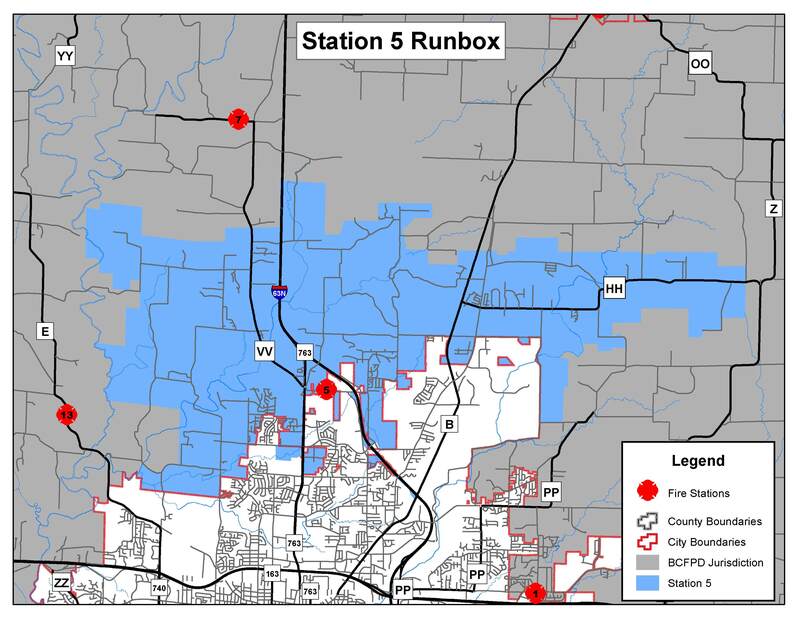 Based on our central location within the county, Station 5 houses many of the district wide apparatus. Our location near the Highway 63/Interstate 70 interchange makes it very convenient to respond to any location within the county. Station 5 has 10 resident rooms where we allow members of the Fire District to live. The Fire District pays for all living expenses (except for food and personal items) in exchange for members to staff each station through the entire district. Our station goal is to always have at least 1 member of the district at the station at all times and without this program, we would not be able to maintain this. By having a Residency Program this ensures that when someone calls for help, Firefighters are there to get the truck out to the call while other members use their personal vehicle to respond from where they currently are. This program helps in part by allowing our organization to stay a volunteer based service, which saves taxpayers of Boone County over $10 million dollars a year (the cost of staffing each station with paid firefighters). The members of Station 5 are great examples of “A Helping Hand”, which is on our uniform shoulder patch. We are always looking for ways to improve our community and enjoy when we have guests stop by and visit us. When you are nearby, please don’t hesitate to drop in and say HI!